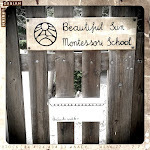 Beautiful Sun Montessori: Smoothing the flow. I was fortunate enough to have had the chance to ask a fellow teacher to observe our flow routine during a day of observation at our school. Her fresh eyes were able to see the moments where the routine of our day was getting us "stuck" and the transition times that were disrupting the calm flow of our day. With her help we made some changes that have really helped our schedule feel like a more gentle passing of moments instead of the stop and go, and bunch of control mechanisms necessary to get all the children to "now do this" and "now we are going to do this other thing." Transitions among the blocks of time are signalled non-verbally. In the morning, I hang up a sign on the classroom door that lets children know the classroom is available. Outside, Noemi sees the sign and also invites children a few at a time to come to the classroom. The environment gradually becomes fully populated. When it is time to cleanup for lunch, a sign is hung on the lunchroom door to let children know lunch is available. We divided the lunch tables into groups and have painted marks on the clock that let children in each group know when it is time to cleanup to go outside. Children who finish all their food can cleanup as soon as they are ready without having to wait for the clock sign. The sign is mostly for those who take a longer time to eat and 30 minutes is the limit for eating. Since last year we have eliminated scheduled whole group lessons including any variation of circle time. Although we occasionally have group meetings, all group lessons in our room are optional attendance. During meetings or when we present something that is interesting enough for all children to want to join, I notice there are always one or two or three children who continue to be engrossed in their own work and prefer not to join. This includes birthdays. Having a choice to participate in the lesson or not also gives me leverage with the children who DO choose to join about what participation looks like. It is obviously more difficult to manage a larger group lesson so we practice how to sit and join lessons, how to listen and observe, and what to do if you want to say something during the lesson. The morning free play time I've also found to be a great moment for me to gather small groups in the classroom to practice grace and courtesy that may be specific to a smaller group of children. Some days the environment calls for more small group lessons during the work period because there is less individual concentrated work happening, and other days I am giving individual lessons and observing for the whole work period. It varies depending on the needs of the group on that particular day. I actually enjoy this fluctuating level of normalization, when there is lots of opportunity for small group lessons it just means I get to play more games and that is also fun.